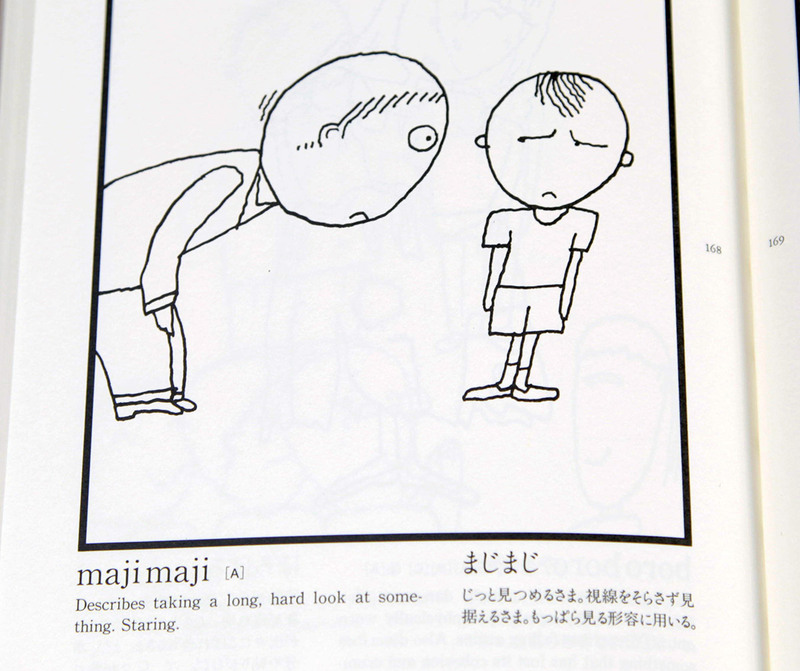 An Illustrated Dictionary of Japanese Onomatopoeic Expressions A picture is worth a thousand words - and you get both! 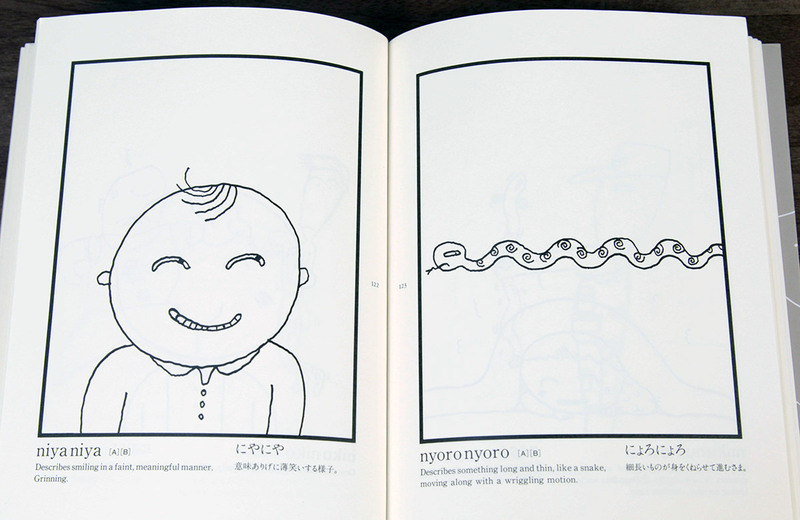 The author of An Illustrated Dictionary of Japanese Onomatopoeic Expressions is Taro Gomi. You may know him best as the author of the seminal and groundbreaking book Everyone Poops. Yes, the guy who wrote *Everyone Poops* also wrote a dictionary. Of course, it's no normal dictionary. Let's majimaji まじまじ（） (take a good look at) it. 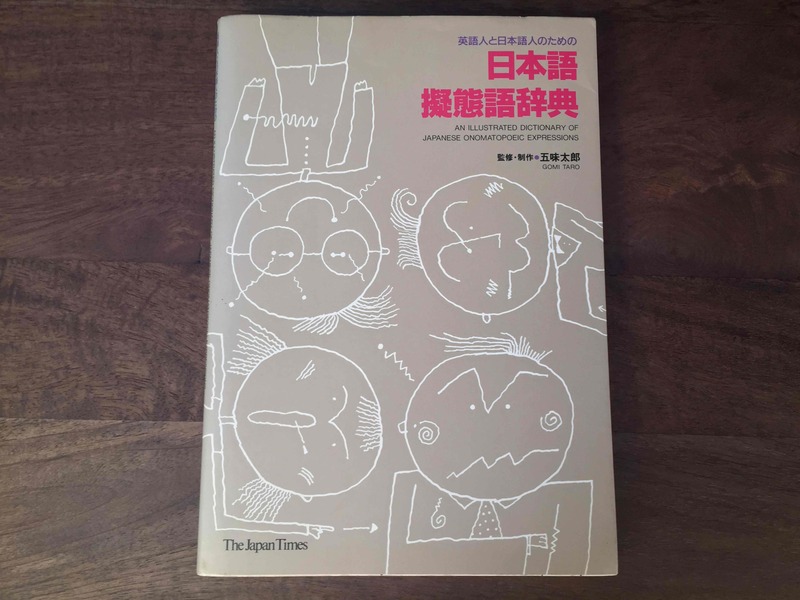 Nihongo Gitaigo Jiten 日本語擬態語辞典（） was first published in 1989 and republished in 2004, but onomatopoeia never goes out of style, especially in Japan. So it's still a useful book to have on hand if you are interested in onomatopoeia, which in Japanese extends far beyond crash, bang and pop. Among the words in this dictionary you'll find ones for the feeling of being electrocuted (biribiri びりびり（）), dozing or napping (utouto うとうと（）), and smiling in a faint, yet meaningful manner (niyaniya にやにや（）). The preface at the beginning is worth a read. It's written in English and Japanese on opposite pages, so you can use it as reading practice too. It's slightly rambling, veering from Gomi's affection for kabuki to his view that linguists are lazy when it comes to examining onomatopoeia. However, what really comes out of the preface is Gomi's motivation for writing the book, his love for Japanese onomatopoeic expressions. When it comes to onomatopoeic expressions in Japanese, however, my cool attitude changes dramatically. I suddenly become very proud and boastful and have a burning desire to introduce them and get people to understand them. The 181 explanations and illustrations of the expressions are the real meat of the book. They are arranged in the same way you'd find in any Japanese dictionary – that is, not by ABCD, but by aieuo あいうえお（）. However, the index in the back lists the words and page numbers in ABCD order, so it's easy to look up a word either way. The only thing missing that would make it a more useful reference tool is an English meaning index. However, it's easy to see why this wasn't included. Since many of the English translations of the words take up multiple lines, such an index would have been impractical. 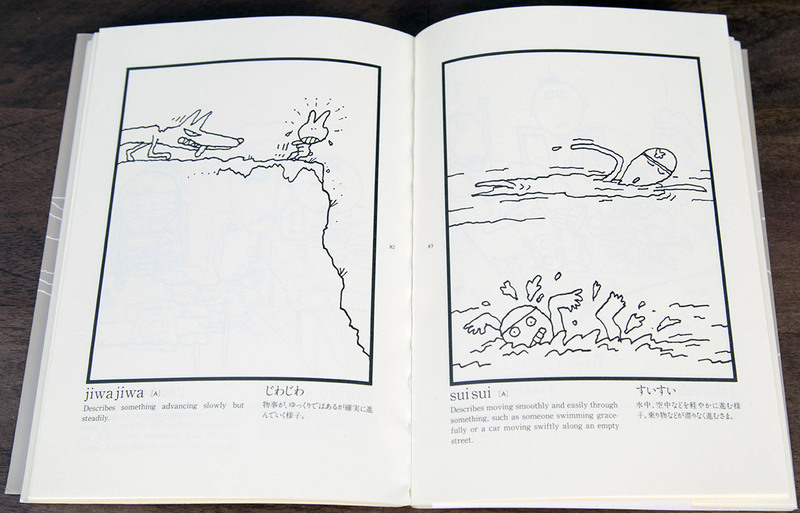 In the main section, each page has one expression, written in hiragana (Japanese onomatopoeia doesn't use kanji). 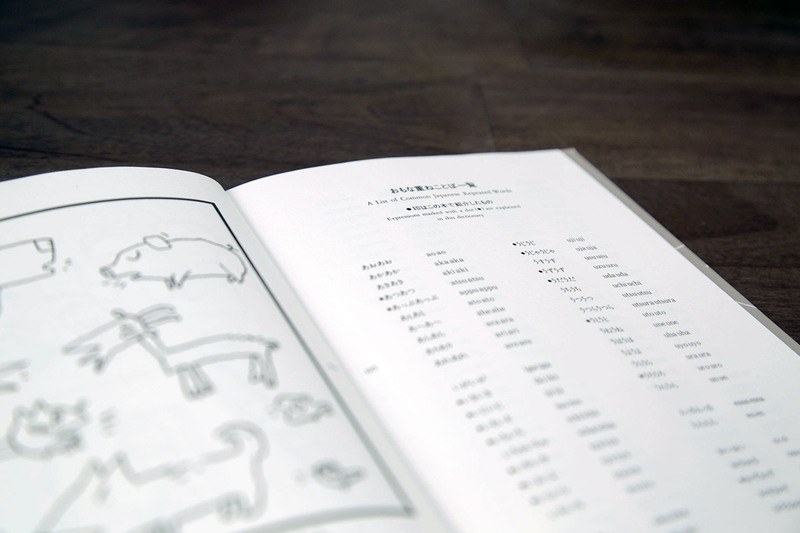 The reading is also given in romaji, making the book suitable for any level. There is a large illustration that demonstrates the meaning of the word. This really helps you get a feel for what sort of situations to use the words in, as well as helping you remember them. It also helps since, even though the English translations are clear and effective, it can be hard to capture the true meaning of the onomatopoeia in words alone. While the illustrations are the special feature of this book, the translations, or perhaps it is better to call them explanations, are good. When one word has multiple separate meanings, they are divided with numbers. 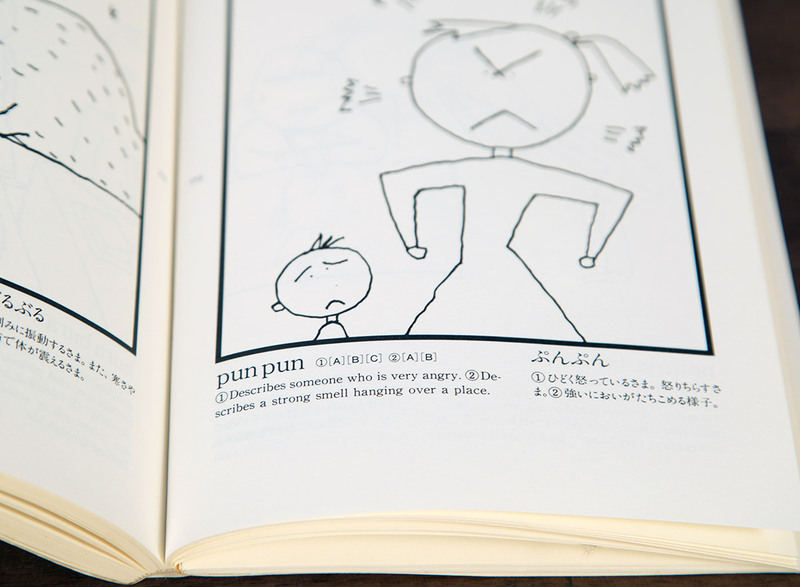 For example, punpun ぷんぷん（）: 1 Describes someone who is very angry. 2 Describes a strong smell hanging over the place. The drawing style may put some people off, as it's not the typical style of manga that has become popular outside Japan. While the drawings aren't particularly attractive, they are expressive, illustrating the words in amusing ways. 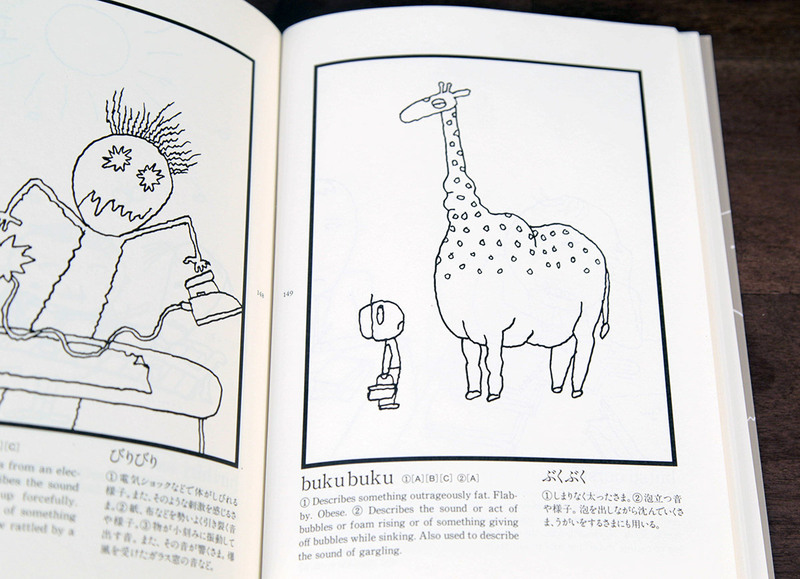 My favourite is the bukubuku ぶくぶく（） giraffe. The illustrations make it a lot more engaging than simply reading a list of words and translations. A useful feature is that where onomatopoeic words have a root in another Japanese word, it is marked with a star. 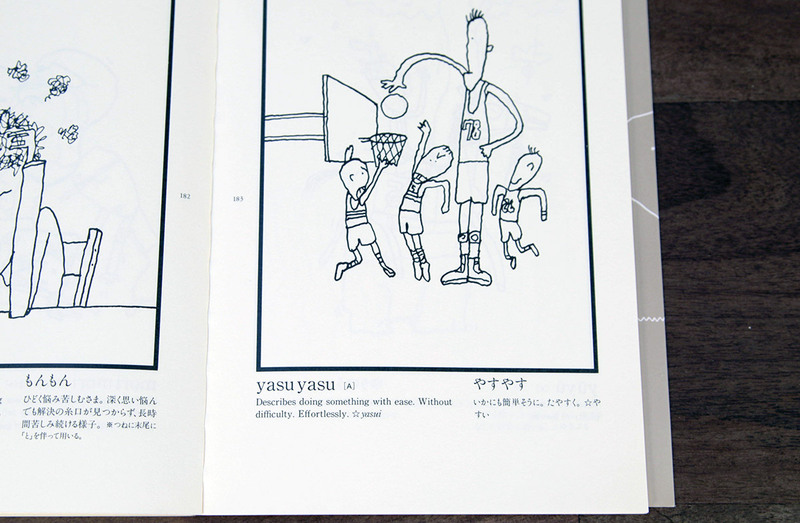 For example yasuyasu やすやす（） (doing something effortlessly) comes from yasui やすい（） (easy). Explanations are also given wherever a particular particle is needed after the word. These are fairly rare, but it's good that they have been noted and explained. Another nice feature is that the English explanation is also written in Japanese underneath. 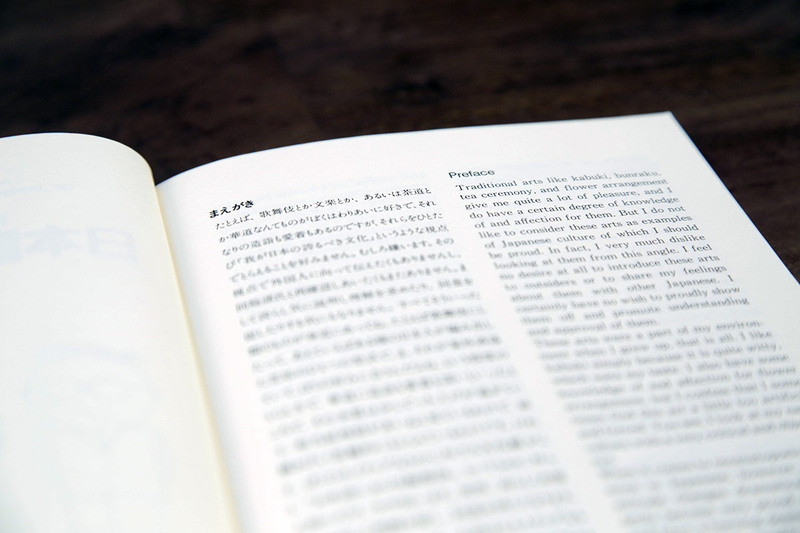 This helps make the book an excellent talking point when sharing it with Japanese people. In my experience, whenever a colleague saw me studying with this book they got a real kick out of it and would look up their own favourite word. The final appendix is a list of other commonly used Japanese repeated words. This isn't much use to the casual reader as no English translations are given, but if you are making a serious study of them it might be of use. Although this is a dictionary, it's easy and amusing to read cover to cover too. I like to flick it open sometimes and challenge myself to work a word into conversation. 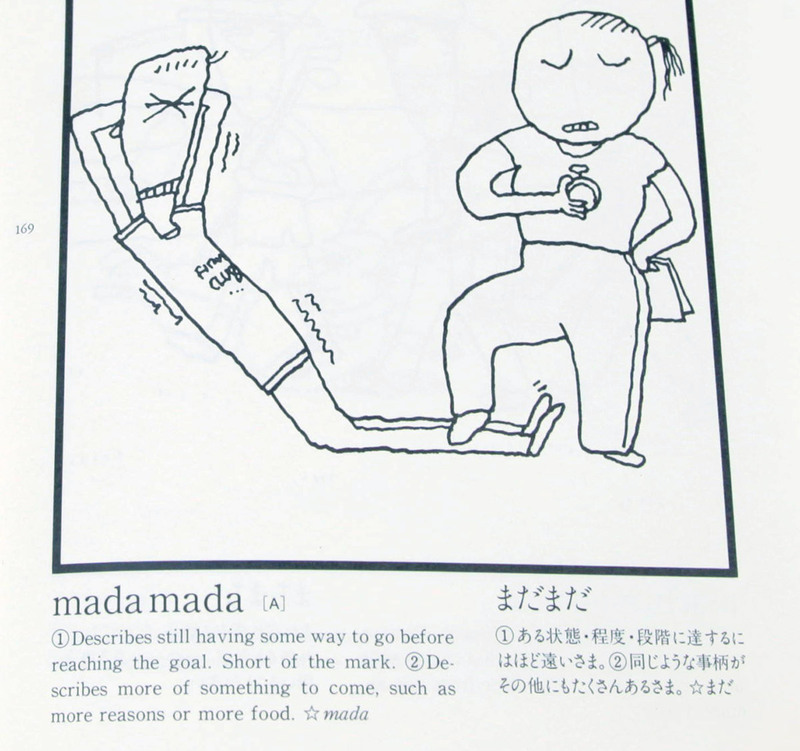 I found that was the best way to become more perapera ぺらぺら（） (fluent), even if I'm still madamada まだまだ（） (not there yet). If you enjoy the world of onomatopoeic expression, I think they will help you understand something about not so much the Japanese language itself as the somewhat grandeur topic of the nature of words. And of course, these expressions are part of the Japanese language; indeed they are raw Japanese, so you will be able to use them as they are. And if you add a little more, you will be speaking wonderful Japanese. I do not necessarily recommend sukiyaki or tempura, but I do suggest you try these onomatopoeic expressions. I am sure you will relish them. This book is cute, funny, and makes remembering onomatopoeia pretty easy. I still think about the ぬるぬる at least once a month.